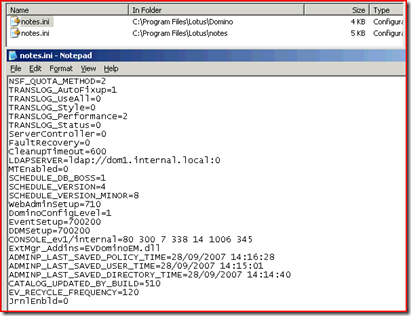 New to Enterprise Vault 2007 Service Pack 1 is a little tweak that can be made to the Notes.INI file on the Enterprise Vault Domino Gateway (EVDG) to change the “speed” at which temporary Notes databases are depersonalised, and renamed to blankX.nsf. 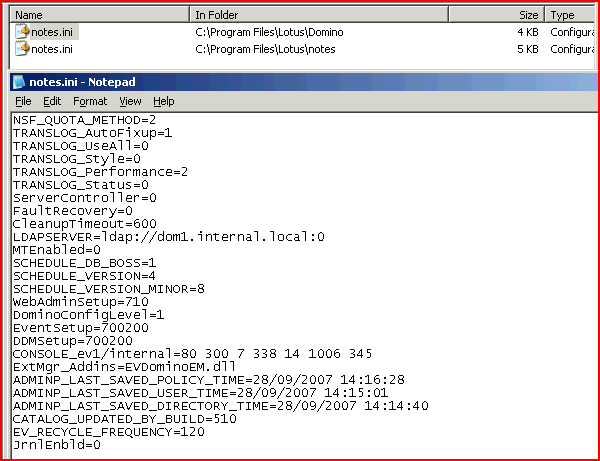 The House Keeping task polls the folder EV under your Domino data directory to work out if there are any unused EV_0000000x.nsf files. If there are, then it depersonalises them, and renames them to blankX.nsf, so that they can be reused for subsequent retrievals. You can add a setting called EV_RECYCLE_FREQUENCY=nn where nn is the number of seconds that you want the nEVHouseKeeping task to poll for unused temporary databases. The default for this is 20 seconds, and if you use FileMon you will see the House Keeping task polling the files to see if they are still used. Using the setting as shown above will mean that the House Keeping task will poll for unused files every 2 minutes.